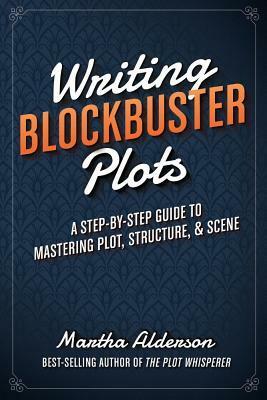 Martha Alderson’s Writing Blockbuster Plots is a one-stop plotting center, clear and concise, and as detailed and as comprehensive as any I have read, my two long-time favorites having been John Truby’s Anatomy of Story and Robert McKee’s Story. Writing Blockbuster Plots is not formulaic. Alderson has written for writers of all creative persuasions and stages of progress. Rather than placing limitations on the writing process, Writing Blockbuster Plots introduces means to ever-expanding possibilities. It’s upbeat and energizing. Be sure to keep a note pad with you. If your experience resembles mine, ideas for furthering and shaping your story will fly to mind. The book’s margins are not large enough to hold them. Martha Alderson overlays her presentation of plot with two suggested guide sheets, the Plot Planner and the Scene Tracker. These two plotting devices do not drive and are not the main topics of Writing Blockbuster Plots. They are, instead, take-a-look guidelines that show our story at a glance, assist in devising our plot and scenes, and reveal problems and opportunities we may not have known existed. Special emphasis is placed on dramatic action, character emotional development and thematic significance. Alderson recommends plotting and tracking on banner paper. For those of us who don’t have the wall space on which to affix six feet of banner paper this is not a drawback. For my plotter and tracker, I have made myself quite happy with sheets of ledger paper taped into fan folds. The hands-on Plot Planner and Scene Tracker span the breadth of Writing Blockbuster Plots. The information they select and highlight comes from its depth—and a lot of it there is. Writing Blockbuster Plots is as deep as it is wide. Its elements of story creation are presented in terms that every writer, regardless of theory-of-plot orientation, will find appropriate and useful. Martha Alderson leads into Writing Blockbuster Plots with a gently metaphorical overview that compares plotting to juggling. She then, in chapter 1, hits us with a definition of plot so pithily inclusive it almost terrifies. But stay tuned. Do not back out. She knows what she is doing. Writing Blockbuster Plots is a page turner and the craft-of-plotting book that will be at my elbow while finishing my first draft and is also the book I’ll be recommending as the read-this-first to my writing friends. This book is one of many out there on how to structure your novel. Where it differs from others is in Alderson's tools, the Plot Planner and the Scene Tracker. The Plot Planner is a way to map the plot of a story out on banner paper, giving you a bird's eye view of the events, conflicts, and structure. Her Scene Tracker is a large-scale chart, also intended to be laid out on banner paper, which allows you to analyze the scenes of your story for several elements. If you don't have the space to work on banner paper, both tools can be used on a smaller scale. If you're already familiar with plot and structure and/or have your own way to analyze your scenes, then you may not find this book to be all that useful, but if you like to think visually, this may be just the book you're looking for. A good, useful guide to plotting that works. Definitely worth reading for the information provided. This book goes over two different techniques on organizing your story: how to use a plotline and scene detail forms. I can't really see myself using the scene detail forms as they are really minutely detailed, but I could imagine needing a tool like that in the future once I've finished a full draft of my novel. The plotline seems to be very handy though. I've already started using the plotline to help me keep my notes in order. I would give this book a try if you are looking for direction on how to improve the overall structure of your novel. Really, really liked the first section of this book (the plot planner). Shed a lot of light on how to handle the overall journey of the plot without getting lost in the tangle that is the middle. Writing Blockbuster Plots is a great resource for my students. They have enjoyed improving their writing with the help of this book. Thanks to Goodreads First Reads for a copy of this book. Alderson's book walked me through two different tools - the Plot Planner and the Scene Tracker - that completely changed the way I see fiction writing. Not everything here was applicable for me, and I don't know if I'll always take such a structured approach to writing, but it was still very useful. I was able to implement several suggestions almost immediately, and it really helped me flesh out some troublesome subplots.I'll be using this book over and over; there's just too much here to completely internalize in one reading. It applies to every step of the writing process - from first draft to final edit - so I know I'll come back it as a reference for future work.HIGHLY recommended for fiction writers.